One of the things I learned from the Expats In Italy web-site was that the USPS offers a relatively inexpensive way to ship books internationally. This is by using what is called an M-Bag or what the USPS calls "direct sacks of printed matter". This can be only books or other printed matter (magazines, journals, etc). You are charged by the weight, from 11 pounds up to 66 pounds, and we were able to send almost 49 pounds of books for $47.50. 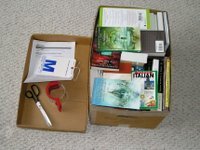 This is how much the 60 books weighed that I was able to pack into a bankers box. We started to collect books that we would want in Italy over the past few months as Valerie is an avid reader who reads almost a book a week, while I read about one a month. This collection of books includes everything from cookbooks to travel guides, Bible reference guides to fiction and some magazines. The reason to ship books is that English language books can be expensive in Italy so we figured for the price of the M-Bag we could have some books sent ahead to us. I tightly packed the books into the box which we then took to the post office here in Corrales, let them see what was in the box then taped it up, stuck it in a mail sack they provided, filled out the required customs forms and M-Bag tag and sent the bag on its way to our friends in Rome. This method is inexpensive because it goes by boat across the ocean, there is no express service in this deal. I have heard it can take as long as 10 weeks for delivery so we will see if we or the M-Bag arrives first in Italy. 12/19/2006: Our M-bag has still not been delivered to Italy. Our attempts to try and track this from Italy and from Corrales have been futile. I would not recommend this as a viable option, even though others have had positive experiences with M-bags. If these are books you really want - don't do it this way! When we left Italy in May 2008, the M-bag had never arrived in Italy! We're sending a lot of books, also. So--maybe we can do some exchanging over the next year. Good luck tomorrow going to the sub-consulate! 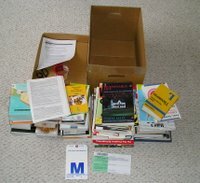 Just get a container, we filled our container with tons of stuff at at least 50 boxes of books, 50 X 50 dollars a box is 2500.00 and that is only on books the whole container costed us about 4600.00. As I'm in the process of shipping my stuff and have heard lots of bad stories about m-bags that never arrived I was curious if yours did by now. Thanks. has your m-bag reached its destination? I am still waiting (6 months now) for a USPS first class parcel sent to me in Italy. What a shame!!! I don't think its gonna arrive. Nope...our bag never arrived and the US and Italian postal systems both deny any responsibility. Someone somewhere has a nice little library. Three years later...still no books. By now we have replaced a good portion of the ones that were in that M-bag. mine arrived in 6 weeks. I send three m-bags. school - You were one of the lucky ones.